The ratio of GDP to CO2 emissions. 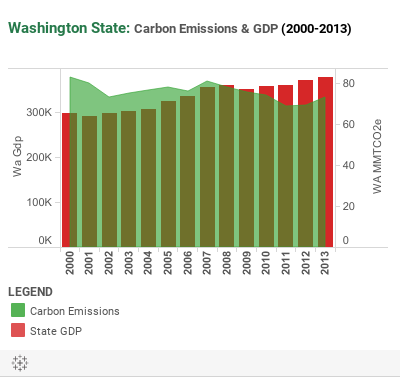 Increasing carbon competitiveness means reducing the carbon intensity of our economy. Metric tons of CO2 equivalent emitted per million dollars of GDP generated. GDP expressed as real state GDP in chained 2005 dollars. Extracting greater economic value from each unit of carbon emission positions us strongly to compete in the low carbon economy of the future. 6th out of 50 states (2013). 192.9 metric tonnes of CO2 emitted per million dollars of GDP. U.S. Energy Information Administration, Table 1, Energy-Related Carbon Dioxide Emissions at the State-Level, 2000-2013.